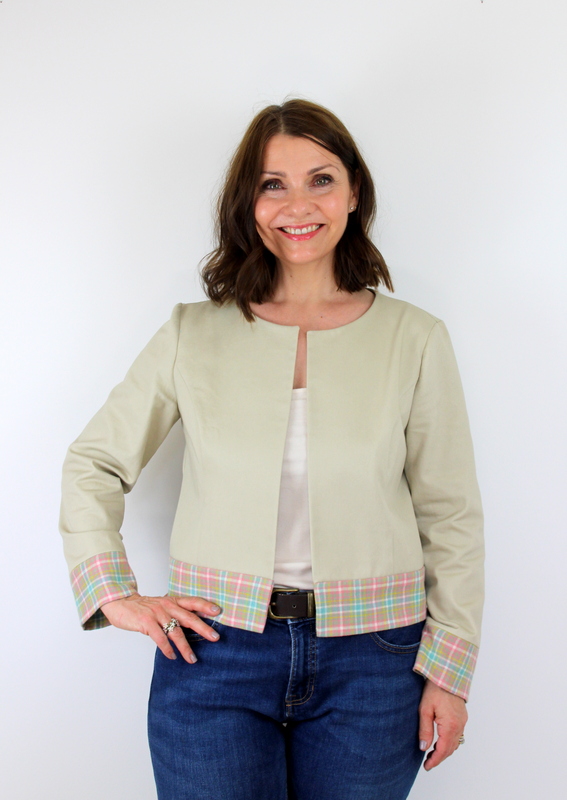 I was very fortunate recently to have been sent a couple of sewing patterns from Simplicity New Look and am sharing with you today my thoughts on the first one. 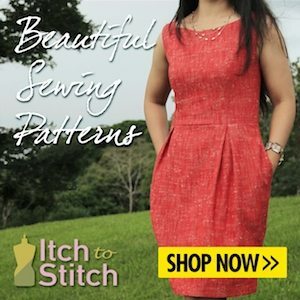 One of the things that swayed me to choose this pattern was the fact that there are options to make knit or woven dresses, and 4 different dress styles too – with mix and match possibilities. Whilst I love the woven shirt dress with the tie belt ( and will definitely be making one of these too), my eye was drawn to version A, which is the knit dress with short sleeves and patch pocket. I really liked the floral fabric that they had used in their image, and knew that I had a similar fabric in my stash. It’s a knit fabric that I picked up last year at a sewing meetup (#sewbrum), from the rag market in Birmingham. For this reason, I don’t have the exact fabric content details, but it has the perfect amount of stretch needed when I tested it against the handy stretch guide on the pattern envelope. 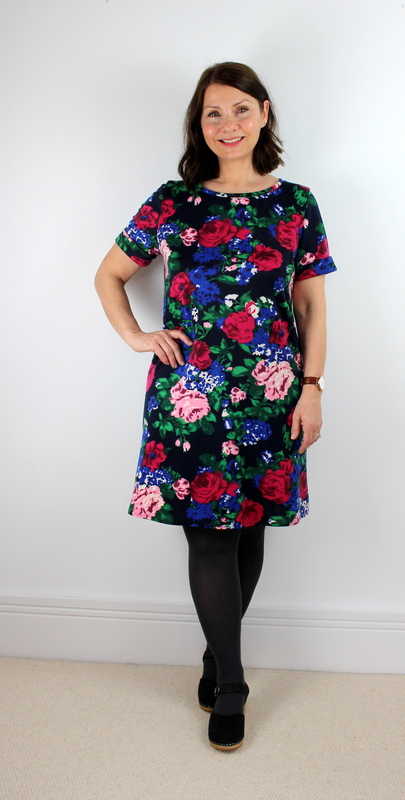 I think that the bold pink, blue and green floral detail on the black background is super cute, and these colours make it very wearable with thick black tights whilst the weather is still chilly. I have lost count of the amount of Simplicity New Look patterns that I have sewn up over the years, so it was no surprise to me how straightforward the pattern instructions were. It is rated as an ‘easy’ sewing pattern and I would agree. For those unfamiliar, the pattern pieces are printed on lightweight tissue paper, and the simple step by step written instructions are accompanied by black and white drawings. The version that I decided to make has a little patch pocket on the chest and I chose to pattern match this as best as I could. It worked pretty well I think, as I think it is almost impossible to spot from a distance (in the image above), although I do think that pattern matching is not essential, and you could totally make a feature of the pocket by ignoring all the pattern matching rules! Another feature of this dress is the deep cuff band, which is rolled back to finish the short sleeve. I think this gives it a more casual feel and makes a change from the usual sleeve finish which is simply turned under and stitched into place. To make sure they wouldn’t roll undone, I decided to stitch a couple of bar tacks on each cuff. To do this I dropped the feed dogs on my machine and set the stitch to a wide zig zag. This gives a neat and secure bar tack stitch which I sewed on the underarm and top of each sleeve. The neck band on the dress fitted perfectly, and required no adjustment. It lays nice and flat and I finished it with a row of twin needle stitching. I also used the twin needle to give the hem of the dress a lovely neat finish. I had a great time making this dress. Quick to cut out, simple to assemble and the result is a dress that will take me through Spring and beyond. I plan to make a t-shirt dress with it this summer as I think it would be cute made from a striped jersey. Thank you again to Simplicity New Look for sending the pattern to me, I am pleased with the outcome and look forward to making more versions for a long time to come. Simplicity 8342 Summer Sewing Challenge Entry. I was really pleased when I heard that Simplicity New Look were holding another sewing challenge. To celebrate 90 years of creative sewing they launched a competition for all to create and share an item of clothing from a choice of 5 patterns. I loved pattern 8383 the most, but as this pattern was for newcomers I was unable to choose it. This left the decision between the Vintage Make and the Dressmaker patterns (as I did not want the Childrenswear or Menswear pattern), and in the end I opted for the Vintage Make pattern as I preferred the jersey top on this and decided that I could hack it into a dress with the addition of a contrasting jersey skirt. I have some jersey fabrics in my sewing stash, but for this project I needed two pieces that would work together, so a little shopping trip into Leicester was required (shame …not)! and the result was this pretty Autumnal berry coloured super soft jersey for the top and a matching berry floral design on a dark background for the skirt. These little gems were from Stuart’s Fabrics on Leicester Market, he has some great jersey fabric at the moment. The pattern is a great one to have. There are 2 versions of the tie front top – either a halter neck or tiny cap sleeves. Also included is a ruffled wiggle skirt and cropped pedal pushers. I stuck to the tie front top and knew that I wanted to hack it into a dress as that way I would get more wear out of it. The construction of the top is straightforward, as usual with Simplicity, and it took very little time to cut out and sew up. There were no surprises and nothing complicated. I cut a straight size 12 and the only alteration I made was to shorten the length of the shoulder straps by about 3.5 cm as they felt a little too long as they were. In order to make it into a dress though, I now needed to take off about 11 or 12 cm from the length of the body. A bit drastic, but this means that the waist seam of the dress sits on my natural waist. By the way, I loved the length of it as a top, and had I been leaving it as a top it would have been the perfect length – not too short and not too long! The skirt was easy to add. A simple full or half circle skirt is fun, and gathers was also something I considered. But in the end I simply chose a skirt from a dress pattern that I have already made and used that! I simply stitched it to the top, made a casing for some elastic from the seam allowance, popped in the elastic to give a very subtle gather, and it was done! I love a dress without fastenings that you can throw over your head and you’re good to go. Hooray for jersey knits! Although all the detail in the design is focussed on the front of the top, the back is pretty to look at too. A small amount of gathering across the back allows for a comfortable fit and makes sure it stays in place! 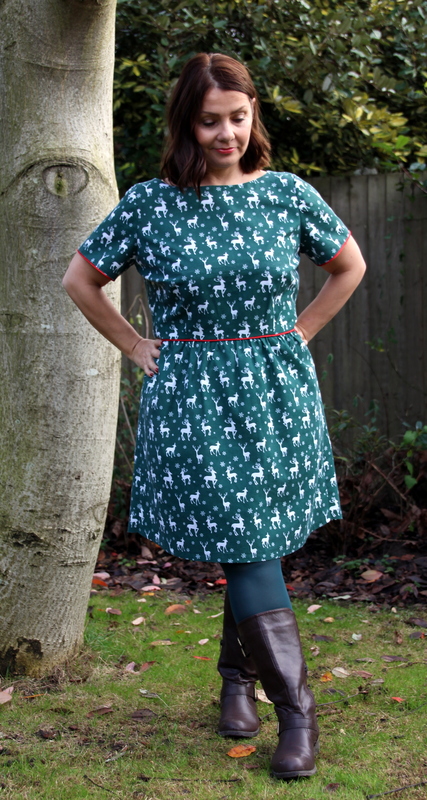 Simplicity New Look 6262 Pattern Review – My Christmas Dress. Forget Christmas jumpers, I’m a dress girl through and through. I have had this Simplicity New Look pattern since July, and just haven’t got around to using it. It came free with the July issue of Sew Style and Home and the style is right up my street. As usual there are a few variations that you can mix up to make your ideal dress. I chose to make the boat neck version as opposed to the v-neck style. I also wanted short sleeves rather than sleeveless or cap sleeves. The construction is pretty straightforward, suitable for an advanced beginner I would say. Anyone who is confident with zip insertion, gathers and darts will be fine with this pattern, although these steps are all explained very well on the instruction sheet, as always from Simplicity New Look patterns. The fabric was an eBay purchase, and once again slightly disappointing. When will I learn to resist a cheap fabric on the internet! It is a poly cotton and was a bit of a bargain, however the quality is not the best, but Hey Ho! you get what you pay for and I reckon I will only wear this dress a couple of times a year given it’s Christmas feel so it doesn’t really matter that much. It has the cutest reindeer and snowflake design and the green background colour is just that of a perfect Christmas tree. So festive! I wanted to break up the colour a little though so decided to insert some berry red piping at the waistline and sleeves and I absolutely adore how it turned out. I will definitely be popping in some piping on more dresses in the future – a great little detail! Take your time with piping, your patience will pay off! Overall I am very pleased with how the dress came out, it’s very comfortable and I will certainly make it again. I would love to make it up it a pretty ditsy floral fabric (Liberty style). Next time I would probably shorten the bodice as the waist is a little low for my body length, easy enough to shorten using the shorten/lengthen markings on the bodice pattern. Also the skirt was slightly too ‘poofy’ for my liking so I slimmed it down a little along the side seams. Oh and as I’m only 5’2″ I shortened the length about 3″. All these things are just my personal preference, I love this pattern and look forward to making up many more versions next Summer. I would love to hear your opinions especially if you have also made this dress pattern. I can’t wait to wear it on Christmas day. Sending you all best wishes for a peaceful and happy Christmas, and I look forward to a busy 2017 with lots more pattern reviews and tutorials.